Should you exercise with GERD? Actually, there are many theories regarding the role of exercise in the treatment or prevention of GERD. 1. One study claims that obesity increases the risk of GERD by increasing the pressure on the abdomen. Some feel that the symptoms of GERD are greatly reduced with weight loss while others feel there is no change and perhaps that massive weight loss actually increased the symptoms of GERD. None of these theories has been proved beyond reasonable doubt. 2. Some other studies claim that the incidence of GERD is more frequent during exercise than at rest, and can be the cause of severe chest pain or abdominal pain during exertion. 3. According to yet another study, an increase in the intensity of exercise caused an increase in reflux in both trained athletes as well as untrained people. 4. Another study states that strenuous activities such as running resulted in aggravated GERD while activities such as bicycling or weight training produced fewer symptoms. 5. Eating just before any exercise causes an aggravation in the symptoms of reflux. 6. Then again, a recent survey found that people indulging in little or no exercise were more likely than active people to be hospitalized for GERD. Faced with such confusing, contradicting data, it makes sense for GERD patients to use exercise as part of a healthy lifestyle plan, but opting for activities that are least likely to cause GERD symptoms for them. Exactly what causes increased reflux during exercise is not known, but experts believe it is likely that body position, motion, and pressure on the abdomen from a full stomach play a role. However, heartburn should not be a reason to stop exercising. Patients can choose their workouts wisely, and take a few steps to prevent heartburn before it starts. 1. Talk to your doctor. 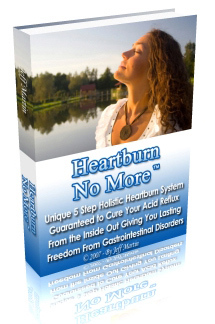 Ask what type of exercises will cause the least amount of discomfort and what you can do to ease the heartburn. 2. Avoid foods high in fat and protein for two hours before workout. Opt for high carbohydrate foods instead. 3. Moderate intake of spicy foods, citrus foods, chocolates, spearmint, caffeinated and carbonated beverages. 4. Do not exercise on a full stomach and eat smaller portions. 5. Drink plenty of water 30 minutes before exercise and sip little amounts every 10 to 15 minutes and after exercise to keep yourself well hydrated and to aid digestion. 6. Jarring exercises such as jogging or high-impact aerobics increases chances of acid reflux. Riding a bike, swimming, or walking causes fewer symptoms. 7. Use an antacid before or during exercise. 8. If pain persists, have it checked out by a doctor to rule out any heart problems. In conclusion, exercise that is light and paced, such as stationary bicycle exercises or light treadmill exercises, as well as yoga and light weight lifting, are extremely helpful in GERD patients, as these exercises allow for weight loss over time. The overall sense of well-being gained from light exercise, with its associated weight loss, makes it an ideal recommendation for patients with GERD. Along with exercise, however, consultation with a holistic practitioner for mental as well as emotional health is also important as part for GERD treatment. Holistic approach treats the entire body not just the symptoms, resulting in a more satisfying and permanent cure.